Context: (Taken from the Newshour with Jim Lehrer, on www.pbs.org ,full transcript at http://www.pbs.org/newshour ) "Born Marcus Rothkowitz in Russia in 1903, he and his family emigrated to Portland, Oregon, where Marcus starred in school and was one of three immigrant seniors to get into Yale. After two years, Rothko dropped out and by his and the century's mid-twenties, he was working odd jobs in New York and becoming an artist. For 30 some odd years that's what he was-an artist-an obscure one. But in the 1950's American culture started to make its global mark. In painting, the style that carried the day was abstract expressionism. Mark Rothko, one of its exemplars, was soon considered an American master. 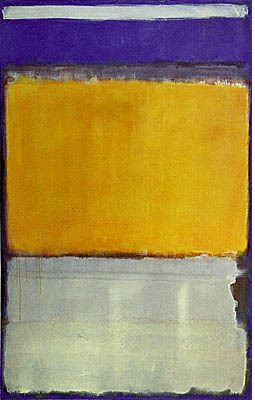 Always melancholy, as Rothko became celebrated and rich, he became more somber, in the end, seriously depressed. He committed suicide in 1970 at age 67. The current exhibit begins with a side of Rothko not often seen, since he destroyed much of his early work. Art historian and Rothko biographer Dore Ashton got to know him when she was a New York Times reporter on the art beat." 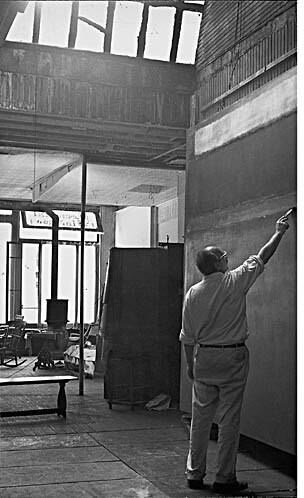 PAUL SOLMAN: When the Federation rejected Rothko's proposal, he went his own way. Soon, he became part of the burgeoning abstract New York School, posing for Life Magazine as one of "The Irascibles" with the likes of Jackson Pollack and Willem de Kooning in 1951. And from this period onward Mark Rothkos are as recognizable as Norman Rockwells: variations on a common, in his case transcendental, theme. But, might they not seem a bit-monotonous? DORE ASHTON: Some people respond, and they think, oh, how could he do the same thing every day, but, of course, if you look at it from his point of view, it's never the same. Each painting is an attempt to express a specific feeling: joy, fear, all of those things. PAUL SOLMAN: Rothko considered his work spiritual and wanted viewers to be spiritually moved by it. And at the Rothko show some were. Nicole Asquith and Ned Steiner actually wrote poems inspired by a 1953 Rothko entitled "Number 61." NED STEINER: Light shines on the other side and is projected into the dark room. Space hanging in space. The water separated from the waters. PAUL SOLMAN: Lynn Metheny had a somewhat different way of putting it. LYNN METHENY: It makes you feel very small in the face of these color fields sort of encompassing you. PAUL SOLMAN: So you're sort of in the paintings? PAUL SOLMAN: He spoke about wanting people to be in the paintings. That's why there are no frames and why it's-the paint is actually all the way over on the sides. LYNN METHENY: And I think, you know, the size of them as well helps that. PAUL SOLMAN: Do you think you have a competitive advantage because you're kind of short? Form: "It would be good if little places could be set up all over the country, like a little chapel where the traveler, or wanderer could come for an hour to meditate on a single painting hung in a small room, and by itself." Iconography: "The Rothko Chapel, on Yupon Street and Sul Ross in Houston, was commissioned by Dominique and John de Menil.qv The building was originally conceived as part of Philip Johnson's campus design for the University of St. Thomas, but became an independent project when the Menils discontinued their association with that institution. 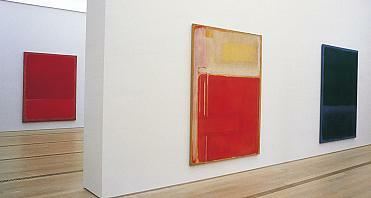 The Menils commissioned a series of paintings by Mark Rothko, who collaborated with Johnson in the design of the structure. 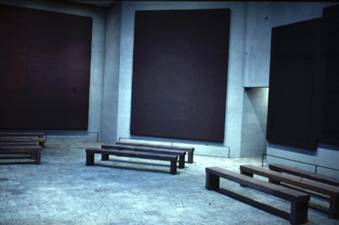 The chapel itself is an austere structure without windows; the skylight that Rothko insisted upon proved to be a poor source for lighting the paintings, and in 1978 a baffle system was introduced. The chapel has an octagonal floor plan in which fourteen paintings are arrayed in eight panels. A triptych of three abutted canvases hangs on the north wall, the east wall, and the west wall. The south wall holds a single canvas. The remaining four canvases are placed on the diagonal axes. The ascetic paintings are limited in color to deep brown, purplish red, and black and express what Rothko called "the timelessness and tragedy of the human condition." Art historian Robert Rosenblum said of the works, "It is as if the entire current of Western religious art were finally devoid of its narrative complexities and corporeal imagery, leaving us with the dark, compelling presences that pose an ultimate choice between everything and nothing." Dominique de Menil said that the works evoke "the mystery of the cosmos, the tragic mystery of our perishable condition, [and] the silence of god, the unbearable silence of God." The Rothko Chapel is owned and directed by the Rothko Chapel Board, of which Dominique de Menil is president and Thompson L. Shannon executive director. The chapel invited individuals and religious groups of all denominations, as well as non-believers, to use its facilities. It has hosted Quakers, Jews, Muslims, Catholics, Protestants, Hindus, Copts, Greek Orthodox, Sufis, and Buddhists. In addition to providing a neutral venue for such luminaries as the Dalai Lama, who met there with representatives of various religions and disciplines during his visit in September 1979 to the United States, the chapel has hosted performances by such religious ritualists as the Whirling Dervishes of Turkey (1978) and the Gyuto Tantric Monks of Tibet (1985). The park in which the Rothko Chapel is located contains several sculptures from the Menil Collection, including Barnett Newman's sculpture Broken Obelisk, which is situated in a reflecting pool opposite the chapel entrance. John de Menil purchased this monumental, twenty-six-foot-high work in 1968; it is dedicated to the memory of Martin Luther King, Jr., who was assassinated in that year. Newman requested that the sculpture be blasted free of its rust-proofing so that the Cor-Ten steel surfaces could acquire a typical Houston patina. The Rothko Chapel sponsors colloquia and since 1981 has presented awards for demonstrations of a commitment to truth and freedom. In 1988 the Second Oscar Romero Award for work in the area of human rights was presented to Paulo Evaristo Cardinal Arns, Archbishop of Sâo Paulo, at a chapel ceremony. The birthday of Martin Luther King, Jr., was celebrated there annually until it became a national holiday in 1985; the United Nations Declaration of Human rights continues to receive annual recognition. In July 1973 the chapel sponsored "Traditional Modes of Contemplation and Action," a colloquium that brought together nineteen international religious scholars and resulted in the publication of Contemplation and Action in World Religions. In October 1983 another colloquium, "Ethnicities and Nations," brought anthropologists and other scholars together to discuss problems faced by traditional ethnic communities when they are incorporated into modern nations. This conference produced Ethnicities and Nations: Processes of Interethnic Relations in Latin America, Southeast Asia and the Pacific. In the pursuit of better understanding between religions and cultural traditions the Rothko Chapel works with such organizations as the Monchanin Cross-Cultural Center in Montréal, Quebec, the Center for Cross-Cultural Studies in Santa Barbara, California, the Fraternité St. Dominique in Cotonou, Benin, the Department of Islamo-Christian Studies in Beirut, Lebanon, and the Instituto per le scienze religiose in Bologna, Italy. EVEN AMONG FAMOUS ARTISTS there are degrees of neglect. 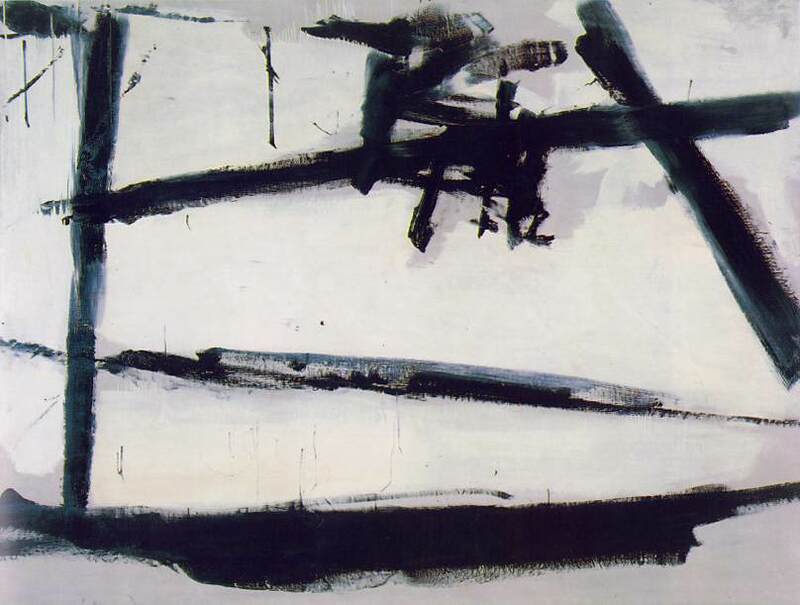 Nobody could call the Abstract Expressionist painter Franz Kline overlooked. Not when his pictures have sold for a million dollars and up. Not with his signature style recognizable in an eye blink, the black girderlike slashes on the white ground. But compared with Jackson Pollock, who has been a household word -- well, in some households anyway -- for the past quarter-century, Kline is positively obscure. It's like comparing Sal Mineo with James Dean. Both were in the movie Rebel Without a Cause, but only one of them car-smashed his way into permanent Valhalla. Kline died in 1961 at the early age of 51, and since then he has not turned out to be a darling of the museums and the art historians. The last full museum show of his work was back in 1985, and in Cincinnati, Ohio; it never came to New York City. 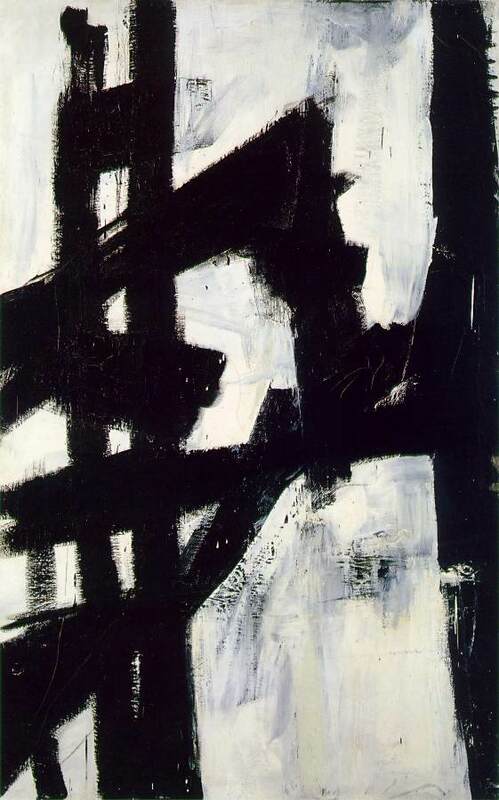 So the present show at New York's Whitney Museum of American Art, ``Franz Kline: Black & White, 1950-1961,'' breaks an unwelcome silence on a strong, if admittedly somewhat limited, artist. It is really the black-and-white works that bear Kline's claim to importance; he was mainly an artist of impact, and when that kind of sensibility uses color, it tends to over- or underuse it, in either case stressing its declarative rather than its sensuous nature. But in monochrome he could really cook. His early figurative work is not in the show, but it is worth remembering for its origins. Born in Wilkes-Barre, Pennsylvania, Kline had an entirely traditional training at the Art Students League in Boston, wanted to be an illustrator and studied for a time (1936-38) in London. He was imbued with the thick-massed but linear realism that came out of the Ashcan School and filled the cartoons that John Sloan and others did for periodicals like the New Masses. He doted on Krazy Kat (as did his friend Philip Guston) and the superstylish illustrations of John Held Jr. The black-and-white tradition was in his head, where it coexisted with a considerable range of other references. People who knew him in the '40s and '50s remember that Kline liked to talk about Gericault and Velazquez, about old silver and 18th century political cartoons, rather than the gaseous rodomontade of ``tragic chaos'' and ``existential risk'' that got loaded onto Abstract Expressionism by such artists as Barnett Newman and such critics as Harold Rosenberg. In short, he was very interested in style, a suspect idea then but one that his paintings are none the worse for raising. We can't see Kline the way the art world did 40 years ago, when critics wrote about his ``desperate shriek'' or his ``total and instantaneous conversion'' to black and white. Ab Ex was less apocalyptic than its fans once thought, and Kline was not so at all. His black-and-white style was a real invention, but its roots are not hard to see. If one was illustration, another was the black-and-white paintings of de Kooning in the late '40s. An early Kline like Ninth Street, 1951, with its traces of looping body shapes, makes that clear. Where it did not come from, though, was where it was often said to have come from: Oriental calligraphy. Of course, there is a superficial likeness between Kline's structures and ideograms in sumi ink on silk, especially in reproduction, when the particular qualities of paint and surface are lost. But the things themselves are very different. ``People sometimes think I take a white canvas and paint a black sign on it,'' protested Kline, ``but this is not true. I paint the white as well as the black, and the white is just as important.'' The black masses and bars aren't just gestures, they're forms; the white isn't an absence but a color. Sometimes the speed of the brush is important -- it leaves frayed edges, something like the speed lines in cartoons, but in other paintings, like the impressive Wotan, 1950, nothing moves or is meant to. The big rectangle anchored by one edge to the top of the canvas has a massive presence and thickness of paint, and its blunt authority looks forward to what American minimalists would be doing a generation later, in the '60s. "De Kooning is probably the most libidinal painter America has ever had. One sees him as the consummate anti-Duchamp, a permanent relief from over-theorized art, a man so in touch with the sources of his pictorial pleasure (the body of paint and the body of the world) that he can render you dizzy with exhilaration. This isn't dumbness but a particular form of sensory intelligence that has always been rare in American art and came, in this case, from outside it. De Kooning arrived in the U.S. as an illegal immigrant from Rotterdam in 1926. He was a gifted draftsman who had already achieved a high level of academic training. But he gradually learned to connect that to a modernist syntax, fusing the line of Ingres and the fragmentation of the antique torso to 1930s Picasso and his American derivatives like Arshile Gorky. Seated Figure (Classic Male), 1940, shows the early stage of this process to perfection. The forms through which De Kooning reached abstraction were always connected to an earlier kind of abstraction, that of academic drawing. 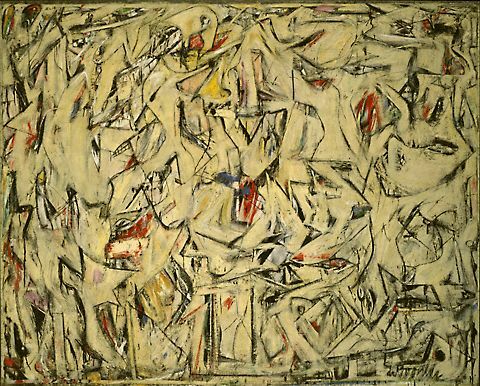 If one were forced to pick the best single picture De Kooning ever painted, it would probably have to be Excavation, 1950: that tangled, not-quite monochrome, dirty-cream image of -- what? Bodies is the short answer: every one of the countless forms that seem embedded in the paint, jostling and slipping against one another in a tempo that seems to get faster toward the corners, can be read as an elbow, a thigh, a buttock, but never quite literally. There is even a set of floating teeth -- the dentures the Women would soon be sporting. De Kooning's characteristically hooked, recurving line takes on an invigorating speed, charging and skidding through the dense paint, slits open with the promise of spatial depth, only to shut again. The only relief from the close churning of forms is a curious ``window'' at the middle of the painting -- red, white and blue -- that looks like a blurred American flag. The work's space is not deep, as the title might suggest, but shallow, like a bas-relief. You keep expecting the image to fly apart into formal incoherence, but it never does: it has the kind of control you see in great drivers or skaters, a supple rigor that seems to exist only on the edge of its own dissolution. One is tempted to say that Excavation is the last great Cubist painting, 30 years after Cubism petered out. All of De Kooning's relation to Picasso is in it. Marla Prather's catalog essay provides the intriguing gloss that the genesis of Excavation began with a black-and-white film, Bitter Rice, a classic of Italian neorealist cinema, starring Silvana Mangano as a rice gatherer in the Po Delta; evidently De Kooning ``responded'' (as what red-blooded Dutch-American artist of 46 might not?) to a sequence of peasant women in tight shorts mud-wrestling in the paddies. If true, this tale illustrates clearly how De Kooning never conceived of painting as a purely Apollonian art: fragments of pop culture -- movies, ads, the immense bric-a-brac of the American desire industry -- were always sailing into his images and sticking there, like bugs on a windshield. 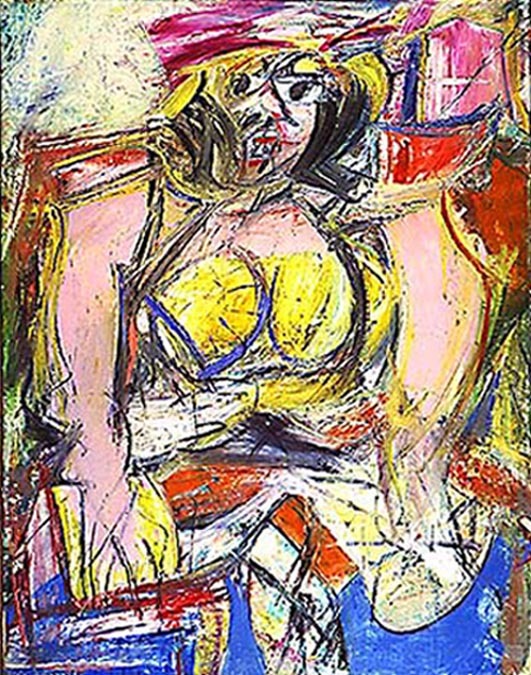 The extreme ``reductionist'' view of De Kooning's career, held by Clement Greenberg and maintained by some critics today, is that after 1950 it went kerflooie. Like Western civilization itself, as his friend and chief critical promoter Harold Rosenberg sardonically remarked, De Kooning was always in decline. This katabasis is supposed to have begun in the early '50s, with the Women series. Greenberg is said to have opined to De Kooning that at this juncture in history (meaning 40 years ago), you can't paint a human face. Sure, said the painter, and you can't not paint one either -- meaning, by this laconic koan, that no matter how abstract you get, people will always tend to read images in the work, like seeing faces in the fire. So why not come right out with the figure? At least it might save the abstractions from gliding into decoration, losing their crankiness and urgency, which was, indeed, what New York abstract painting did when lyric acrylic on unprimed duck became all the rage in the 1960s. 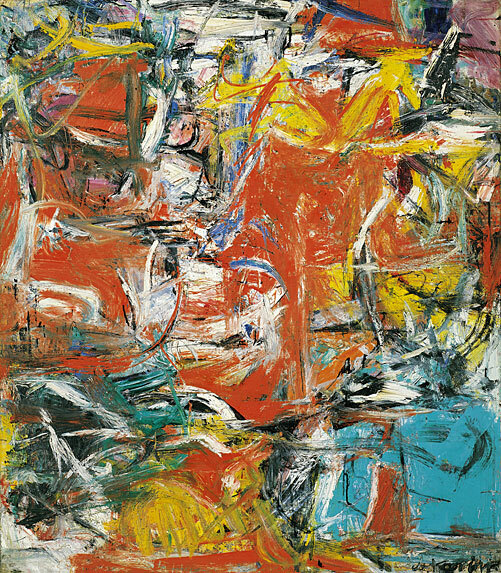 Abstract Expressionism in the hands of its two masters, Pollock and De Kooning, at least -- had a way of disappointing the critics who wanted it to be more abstract than it was. Just as Pollock's all-over paintings wouldn't be so great if they weren't landscapes, full of wind and weather, light and pollen, so De Kooning's work benefited from the grand ghosts of Dutch baroque figure painting, who kept jolting the artist's elbow. 25 3/4 in. by 19 5/8 in. 23 1/4 x 23 1/16 in. female counterparts went wholly unexamined. 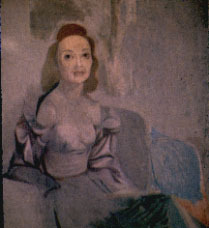 The wife of Willem DeKooning, Elaine De Kooning, was "a writer, [and] belonged to a group of critics," explained Schapiro. "There were many women in the club, sitting quiet, and [Elaine] knew that the wives of those artists were very good artists themselves." 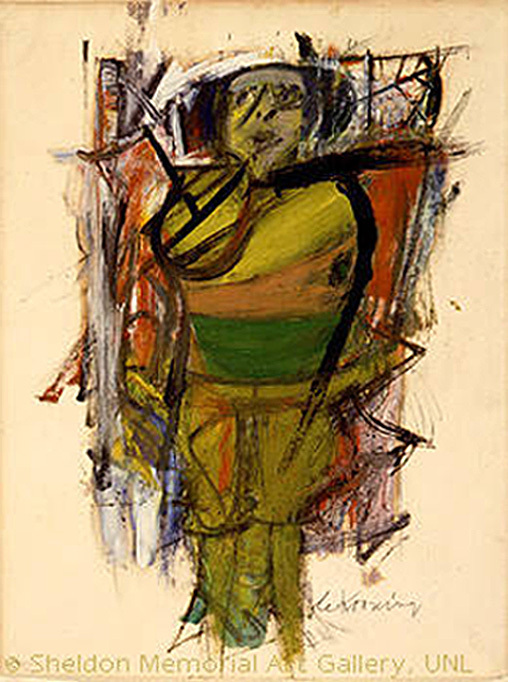 As a result, Elaine De Kooning curated a show of all women artists, of which Miriam Schapiro was a part. "This was long before feminism," said Schapiro. When feminism did begin to gain attention, a whole set of institutional and psychological undercurrents in society found expression in the works of artists and writers. "I remember," said Golden, "reading Betty Freidan's Feminine Mystique - I was on an airplane and I turned to the man next to me and said, 'Isn't this exciting?'" 79 1/8 x 69 1/8 inches. Solomon R. Guggenheim Museum. 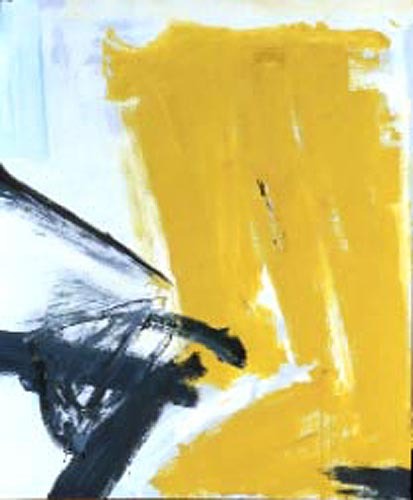 Form: "Composition serves as a bridge between the Women and de Kooning’s next series of work, classified by critic Thomas Hess as the Abstract Urban Landscapes (1955–58). According to the artist, “the landscape is in the Woman and there is Woman in the landscapes.” Indeed, Composition reads as a Woman obfuscated by de Kooning’s agitated brushwork, clashing colors, and allover composition with no fixed viewpoint. Completed while the artist had a studio in downtown New York, Composition’s energized dashes of red, turquoise, and chrome yellow suggest the frenetic pace of city life, without representing any identifiable urban inhabitants or forms. 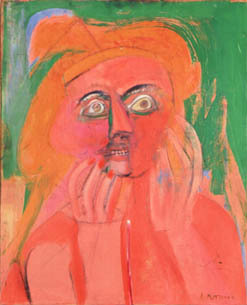 "( www.guggenheimcollection.org)Iconography: This early work by DeKooning shows him at his abstract best. Here it is evident that emotion ruled his paintbrush, as evidenced by his slashing brushstrokes and violent colors. One would be interested to note, however, that he did not do his paintings as quickly as it would appear. He often spent hours agonizing over the strokes, wiping away the paint when it angered him, leaving it when he felt it was right. This obsession with detail and feeling in his work may be what adds to it the aura of unease and feeling of psychological unrest. Context: This painting was done a few years after his close friends suicide, and it is apparent the frustration and unhappiness with which he seems to paint. There is, in popular culture, an ideal of an artist as a struggling, unbalanced, and unhappy head case. Though we as a society may romanticize such notions of the awful muse that inspires such work, it can be difficult to look at this work and not feel empathy for someone who is in such obvious pain.